www.kalyaninfotech.com provides online support to its clients. The company assists the clients for their any kind of queries related to the web application developments, softwares, server and client side. As the company is related to the software developments, website designing and website maintenance. The company is also supports the lost passwords. 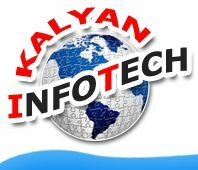 www.kalyaninfotech.com also provides a facility to the users to send their questions through email. Get ready to solve your problems as hard as they are for you and get the answers ready for you. You can send the queries related to the web applications, hosting, softwares, related to websites maintenance, designing and developing.